Pictured Above: PETER PILOTTO for Target Bikini Top in Green Floral Print ($22.99), Pant in Green Floral Stripe Print ($39.99), Tote in Green Floral Print ($39.99), Slip-On Shoe in Green Floral Print ($29.99) *Target.com Exclusive | Available Globally on Net-A-Porter.com - Photos Above Provided by Target, but the Collage is by yours truly! 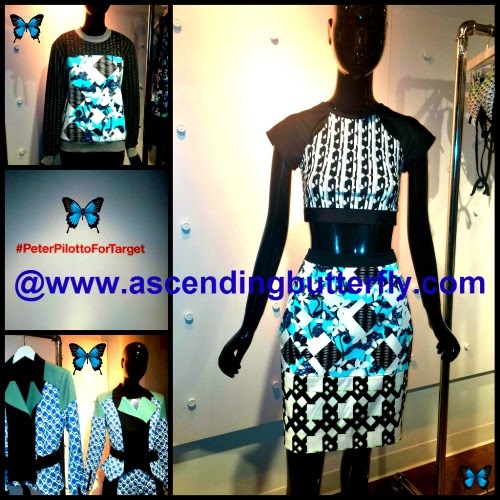 We are just weeks away from a new 'Must-Have' Fashion Collaboration, and Ascending Butterfly got the chance to check out the new PETER PILOTTO Collection for Target on Monday night up close and personal. Peter Pilotto and Christopher De Vos the London-based design duo behind PETER PILOTTO are collaborating with Target for a bold, bright, Spring womenswear collection which will make its debut on February 9, 2014. PETER PILOTTO for Target will feature approximately 70 items, including dresses, skirts, clutches, swimwear, Totes, and even Slip on Shoes with most items retailing for less than $60 - making the collection not just fun but affordable! Taking home a little luxe at a price that won't break the bank is sure to put a 'spring' in your step, and with the bright cheery colors and bold prints I am pretty sure it's like nothing you already own. With a nod to the brand's UK roots, Target is making the collection available to international fans as well via online luxury retailer Net-a-Porter which will carry a curated assortment of this limited-edition collection. 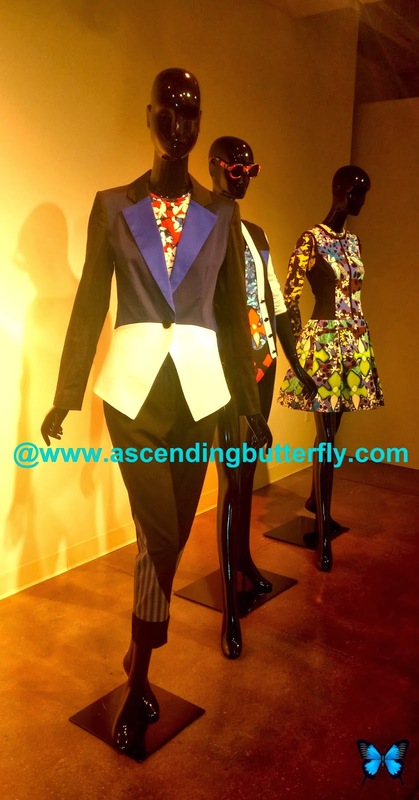 You will find bold color combinations - like blues and greens or warm reds with mixed oranges (some of my personal favorites), some sculpted silhouettes and very smart use of color blocking as well. Above: I am absolutely LOVING this jacket! I personally would not wear it with something with a print under it as shown, I'd go solid, but this jacket is probably the most 'me' piece in this collection! But as a typical all things black clothes loving New Yorker, I guess it's no surprise that this jacket would be my standout favorite. Above: This is probably more print all at once than I'd personally do, but I adore the color combo, red/black/white and grey are a personal fave of mine, I will admit the stripe makes a very slimming optical illusion for the eye, so this may be one I need to try on myself before I decide! I think it's clever how the dress is being worn right on top of the Shirt in the Green Floral Print in Purple Floral Print (if your summer arms are not quite in shape yet, having a little sleeves in a nice lightweight material is perfect! Above, Top Left: PETER PILOTTO for Target Sweatshirt in Light Blue Floral/Check Print ($29.99). Pant in Black/Check Pring ($34.99), Above Right Solo Shot Model is wearing Bikini Crop Top in Black/White Pring ($24.99), Skirt Light Blue Floral/Check Print, ($34.99), Middle (left) Event Hashtag for the collection: #PeterPilottoForTarget, Lower Left: Moto Jacket in Blue Netting Print, ($59.99), Cropped Sweater in White/Blue Print, ($29.99), Short in Blue Netting Print, ($29.99). I am fond of Turquoise/White/Brown or Black in summer, so these color combinations were definitely a hit with me! PETER PILOTTO for Target Collage, #peterpilottofortarget - Designer is in the CENTER square! Check out the pictures in our Pinterest Board, where you can see everything in full size! This collection is a bit like a Kaleidoscope come to life, with super vibrant patterns, splashes of bold color and an easy spring into summer mix and match appeal. You are going to have to fun with the sunglasses, and the Totes with their matching Slip-On Shoes keeping a unified look among the various wardrobe mix and match color and endless pattern combinations that are available. The collection will be available begining February 09, but won't be available for long, so be prepared to pick your favorites using their look book. This way when the ordering lines open you already know what you want and have a plan of attack and game plan to get your favorite pieces! Check out the Official Look Book HERE! If you do buy something from this collection, we'd love to see your pictures! 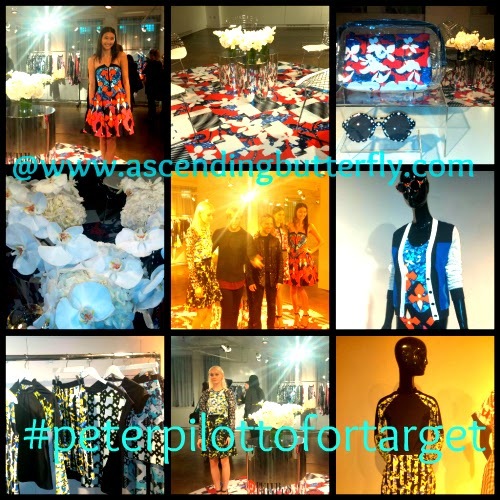 Tag them on Twitter using the hashtag #peterpilottofortarget be sure to include: @PeterPilotto @TargetStyle and @Ascending1 so we can see your cool new outfits, sunnies and slip-ons! FTC Disclosure: This is NOT a compensated post, however I was provided with a Tote Gift Bag from the collection. However, All opinions are 100% my own! I am disclosing this in accordance with the Federal Trade Commission 16 CFR, Part 255 - Guides Concerning the use of endorsements and testimonials in advertising, you may check our Giveaway and Disclosure Page for additional information regarding Ascending Butterfly Disclosure. Great bright colors .my fav. is the blue dress with the red and white flowera ! @Big Happy Buddha - That's a great pick! @Bohemian Babushka - I'm glad you like the collection too, I'm looking forward to launch of the collection at Target, I am definitely going to pick up the color block jacket! I definitely love that each piece makes a statement and just has so much color, life and personality! @Katherine - Perfect for Spring! I love the patterns on these outfits. They are stylish and unique. They have some really great dresses. Love the floral print and belt dress. @Ave T - That dress is a popular pick! Bold pattern and color make it a standout!